Sub-seasonal to Seasonal climate predictions for Energy (S2S4E) project, coordinated by BSC, aims to offer an innovative service to improve renewable energy variability management. BSC hosts today the kick of meeting of the H2020 project “Sub-seasonal to Seasonal climate predictions for Energy” (S2S4E). The project, awarded with 5M€ for the next three years, is coordinated by the Barcelona Supercomputing Center-Centro Nacional de Supercomputación (BSC-CNS) and brings together 5 European research centers, 3 energy companies, 3 SMEs and a large consultancy firm. The goal of the project is to create an operational climate service that will enable renewable energy producers and providers, electricity network managers and policy makers to design better informed strategies at sub-seasonal to seasonal timescales. Renewable energy offer environmental, economic and energy-security benefits and wind energy is expected to be the largest source of renewable energy through to 2030 in the energy mix, a necessary step for the transition to clean energy, one of the UN Sustainable development goals. Renewable energy also brings, however, big challenges. In particular, the generation of renewable energy and operational planning are strongly affected by weather and climate, which cause wide variations in both energy supply and demand. This works as a major barrier to renewable energies’ integration in electricity networks as knowledge of power output and demand forecasting beyond a few days remains poor. To help solve this problem, S2S4E will offer an innovative service to improve renewable energy variability management by developing new research methods exploring the frontiers of weather conditions for future weeks and months. The main output of S2S4E will be a user co-designed Decision Support Tool that for the first time integrates sub-seasonal to seasonal (S2S) climate predictions with renewable energy production and electricity demand. The long-term expected impact is to make the European energy sector more resilient to climate variability and extreme events. Currently, BSC has two operational services on air quality (CALIOPE and the Barcelona Dust Forecast Center-BDFC) providing air quality and Dust predictions respectively. 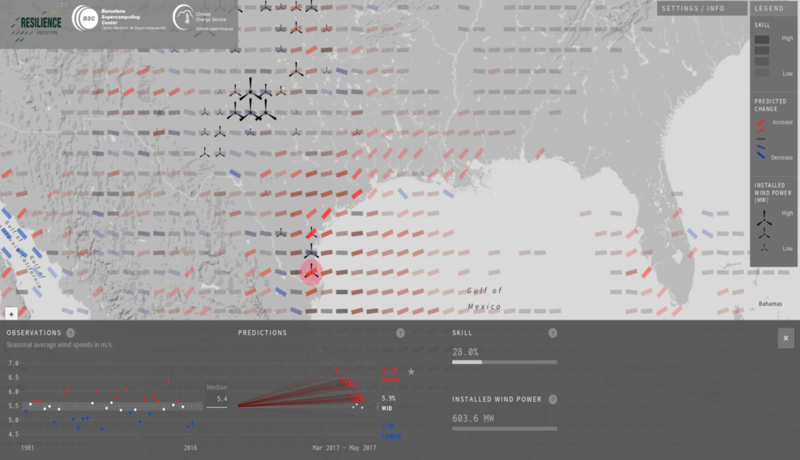 The Decision Support tool developed in S2S4E will provide operational climate predictions. All these operational services based on earth system modelling require High Performance Computing to generate and handle the huge amount of data (of the order of PetaBytes) needed by the impact models used by the services. Without supercomputing facilities such as MareNostrum or other European supercomputers in the PRACE network, the climate services community could never provide operational solutions to business stakeholders. The start of the S2S4E project happens at the same time as the European Commission proposes to invest EUR 1 billion in world-class European supercomputers. * Resilience_prototype - Picture caption- "Interface of the Resilience prototype that will be the start point for the Decision Support Tool (DST) developed in S2S4E"